It’s elementary that any Conan Doyle fan will want this splendid set of Sherlock Holmes mysteries—twelve timeless classics performed as radio theater, linked by violin music interludes. 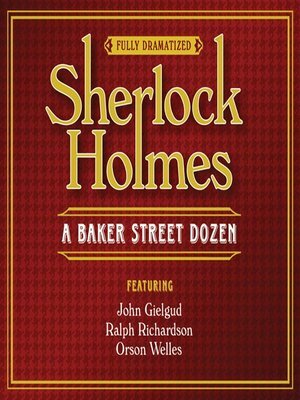 The great Sir John Gielgud stars as the sleuth of Baker Street, with Ralph Richardson as his venerable companion, Dr. Watson, and Orson Welles as the nefariousProfessor Moriarty. With three giants of the theater in such colorful roles, it’s no mystery why this collectionwas so popular on cassette. Original material © 1953 Charles Michelson, Inc.